Bring industrial-styled support to your potted plants or garden shrubs with these Gardman Black Blacksmith Folding Obelisks. These 2 innovative, paneled units offer a wonderful bit of support to climbing plants, and their steel construction provides sturdiness. 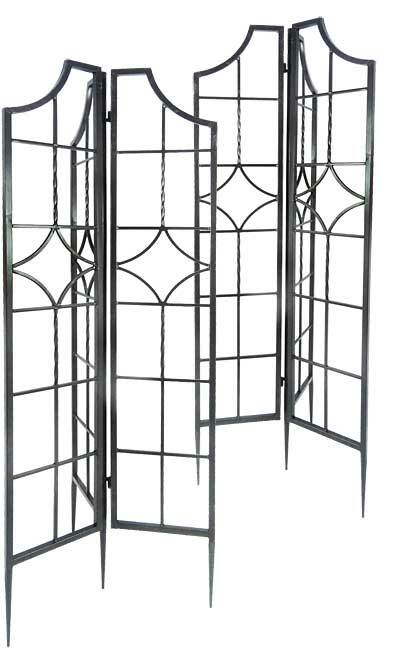 Each obelisks has three, 10" wide panels which extend outward from a center hinge, and their square bar construction enhances the hardy theme. Rectangular openings on the panels lend a geometric hint to any setting, while a central diamond on each offers contrast. Pointed legs insert into soil in moments, and a black, powder coated finish protects the units from the elements. Add lasting and lovely support to two plants with these Black Blacksmith Folding Obelisks. Note: This case pack includes 2 of the Gardman Blacksmith Folding Obelisks, Black, 59". Gardman Blacksmith Folding Obelisk, Black, 59"